With one of the keynote speakers, Rev. H.B. Charles of Shiloh Metropolitan Baptist Church, Jacksonville, Florida. We cannot do ministry without the Holy Spirit. The keynote speakers, H.B. Charles and Geoff Thomas, emphasized on our need for the Holy Spirit to empower us not only for ministry but also for our personal walk with Christ. Without the Holy Spirit our preaching and shepherding is in vain. I know that many of us know this truth very well but how often do we live as if we don’t know it. So, it was a blessing to be reminded again of our need and dependence upon the Holy Spirit who not only empowers us but also continually intercedes for us. As H.B. put it, the Holy Spirit is our ultimate prayer partner. The best of men are men at best. Jon D. Payne gave a lecture on the life and ministry of Dr. David Martin Lloyd Jones fondly known by many as the doctor. We praise the Lord for the life and faithful ministry of Dr. Jones who as Payne put it is probably the greatest preacher of the 20th Century. Yet despite being used greatly by Christ, the doctor just like all of us was also a man of weaknesses both personal and theological. Payne focused more on the latter and highlighted some of the doctor’s shortcomings in the area of pneumatology (doctrine of the Holy Spirit). D. Martin Lloyd Jones like many of the Pentecostal and Charismatic Christians today believed in the baptism of the Holy Spirit subsequent to conversion. He even supported the charismatic movement of his day in private but never in public. As I sat and listened to the lecture, I recalled one of my professors in seminary who often reminded us: the best of men are men at best. The best among us are made of feet of clay. This truth calls for humility and teachable spirit when fellow brothers point us to our own shortcomings, which we might be unaware of. Never neglect the courts of the church. I was encouraged to hear of what the Lord is doing in the Presbyterian Church of Ireland. The denomination is slowly recovering from the liberal direction it had taken over the past four decades or so. One of the factors that has contributed to this good development is conservative men taking initiative and being fully involved in the courts of the church, especially, at presbytery and synod levels. These brothers have with patience and endurance fought the good fight without despair. The Lord is now rewarding their faithfulness. One lesson I gathered as I heard this uplifting news was to never forget that the Lord is still at work even in our church courts although they might be imperfect and often heavily tainted with our sin. The power is in the word itself. Using the parable of the growing seed in Mark 4:26-29, David Strain encouraged us to continue steadfastly with the means of grace ministry. He focused more on the power of God’s word. As preachers, we have been called to do two things: sow the seed and harvest when the fruit is ready. What happens between the time of sowing and harvesting is none of our business. “Growth is God’s business, faithfulness is ours.” The power of the gospel is not in our gifts, skills, academic abilities, or anything in us. So we should never be tempted to think that we could improve the gospel in any way. What a comforting truth! I praise the Lord that I was at TLF this year because this is exactly what I need to hear. All is not lost in Scotland. I should confess that I have a special place for Scotland in my heart. As a Presbyterian from Malawi, Scotland is my “holy” land so to speak since it was the Scottish missionaries who first brought Presbyterianism to Malawi in the late 1800s. Over the years I have been hearing depressing stories of Presbyterianism dying in Scotland. But I was encouraged last week to hear stories of God’s powerful work there. I met some brothers who are involved in planting churches in the toughest and poorest neighborhoods of Scotland through 20 Schemes Project. My heart rejoiced and I praised the Lord for the great things he is doing in the once called ‘land of the Book.’ I will continue to pray for revival in the land of the Scots as I also continue to pray for revival in Malawi and North America. 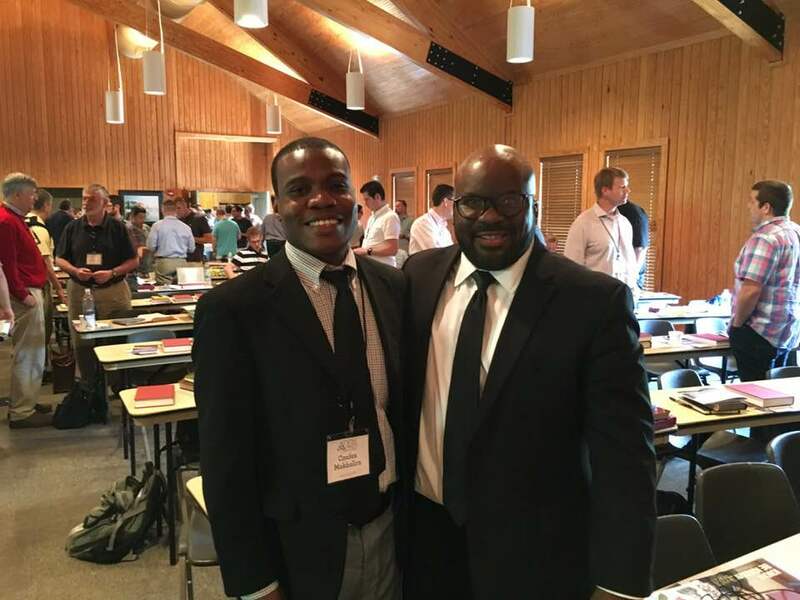 “Brother, we are praying for you and we will get behind God’s work in Malawi.” During the fellowship I had a couple of opportunities to share my desire of returning to the land of my birth to plant confessional Presbyterian churches as well as train young men for ministry. Confessional Presbyterianism has been on its deathbed for a long time in Malawi. There is a need to revive it, the Lord willing, as one way of combating false teachers and prophets that have gone out deceiving people and hewing cisterns that will not satisfy. The work is huge and who is sufficient for these things? For sure, not me! But praise God that Christ is sufficient and has promised, “I will build my church and the gates of hell will never prevail against it.” Oh, what a promise! So I was greatly encouraged to see the brothers getting excited with the work and praying for it. As the week came to an end, I packed up to fly out of the warm and beautiful spring of Jackson, Mississippi into the snowy and gloomy spring of Lansing, Michigan (not complaining at all for I have learnt to give thanks in all things). Throughout the way I praised the Lord for a rich fellowship of like-minded brothers. “Behold, how good and pleasant it is when brothers dwell in unity…It is like the dew of Hermon, which falls on the mountains of Zion! For there the LORD has commanded the blessing, life forevermore” (Psalm 133:1, 3).